In its typical conspiracy theory-weaving style, Russia Today attempted to imply a connection between the U.S. military and the 2012 Facebook experiments on emotional contagion that have drawn such an outcry this Summer. The article, provocatively titled “Facebook mind control experiments linked to DoD research on civil unrest” tried to make the link by mentioning that one of the three authors of the 2012 Facebook project had also been involved in a separate project that was funded by the Department of Defense via the Minerva Initiative. The rest of the article is composed of a series of ever more tangential associations that would only seem relevant or meaningful in substantiating the supposed link if one were idly skimming over the document rather than actually reading through it, but it would seem that the authors were trying to give the impression that the U.S. military might be behind civil unrest around the world and/or might intentionally foster it within the U.S. to justify a military coup. Ironically, there actually is a great deal of U.S. military-funded research on social media (some of it even with the direct involvement of Facebook Inc.), which the authors of the article could have cited as background to flesh out their paranoia manufacturing and make their smoke and mirrors less obvious, but it would seem that they neglected to do background research in preference to playing six degrees of separation. I have to say that I am disappointed. One would think that with the extensive financial and political support of the Kremlin behind them that Russia Today’s writers would be more effective at their jobs of fostering mistrust of Western governments. In fact, after the controversy erupted about the publication of the 2012 Facebook emotional contagion study, DARPA’s Social Media in Strategic Communications Program was quick to release a statement specifically noting that their program was uninvolved with it, that they do not support any research involving deceiving unwitting participants, and that their findings are all transparently published in scientific journals. In addition to a great deal of general foundational work on modeling and data mining social media, these publications have included work analyzing the evolution of Occupy Wall Street, modeling protest movements like the 2013 Gezi Park demonstrations in Turkey, distinguishing true grassroots movements from astro-turfed ones, investigating social bots, and quantifying the diffusion of innovations. 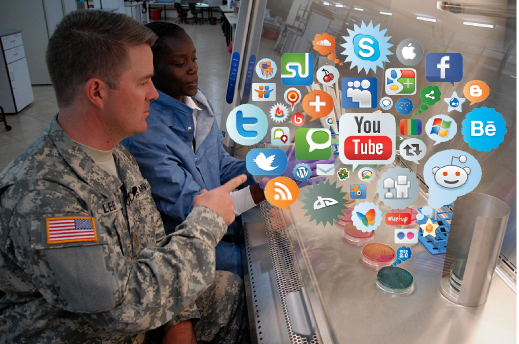 Another hub of U.S. military research into social media is the Naval Postgraduate School’s CORE Lab, that explicitly describes its mission as “Advanced Network Analysis, Data Visualization, Research, and Strategies for Irregular Warfare.” The lab’s public newsletter (most recently published here) elaborates on their work in detail. One project mentioned in the CORE Lab April 2013 newsletter involved used advanced social media mining (including their own creation the Dynamic Tweet Network Analyst software), combined with geospatial/temporal mapping and network analysis software to verifiably identify relations, objectives, and tangled affiliations of Syrian resistance movements including distinguishing between those groups that actually aligned with U.S. policy objectives (as opposed to those who merely claimed to) and determining the validity of the victories that each group claimed. The report proudly states that intelligence professionals “marveled at how quickly three researchers could illuminate and map element of the Syrian political and armed opposition…” and quotes one (unnamed) officer as saying that “‘this would have taken an entire intelligence section numerous months to develop the analytical products and potentially years for the intelligence community to develop the sources and contacts with access to this type of information.’” One could certainly imagine how, if these techniques had been used by the wider intelligence community (instead of just the officials evaluating the program,) it might have been helpful in bringing earlier attention to the rise of ISIS. The CORE Lab’s social network mapping software Lighthouse has also been applied by U.S. police to analyze and aid in the dismantling of gang networks through their aptly named GANG program. The U.S. intelligence community is also performing in-depth research via social media. The Intelligence Advanced Research Projects Agency, IARPA (like DARPA, but for the intelligence community) has been making strides with the Open Source Indicators program using social media data (and other data). Researchers supported by the program have claimed success in forecasting mass protests, disease outbreaks, and the diffusion of news on social media. Several of the publications imply that their findings could be used for more than just passive monitoring and forecasting, but to actively direct events. One of the papers about modeling news and rumors notes in its abstract that their “approach can be fruitfully combined with other strategies that use content modeling and graph theoretic features to detect (and possibly disrupt) rumors”, while another discusses designing “counter-contagion strategies” to set the agenda on social media or disrupt the plans of others to do so. See? There’s so much fodder that Russia Today could have easily selectively used. If I were Putin, I might be demanding a refund. Perhaps I’m being too hard on the writers though. Perhaps their workload has been growing as the Kremlin’s tight editorial hand has recently caused the station hemorrhage reporters like the on-air resignation of anchor Liz Wahl in March, and the high-profile loss in July of London correspondent Sara Firth who also claims that RT has been quietly losing quality staff for some time. An ISIS promotional image. Authentic, according to the Guardian. Seriously though, the Russia Today article probably performed precisely as intended, especially if its over 10 thousand shares on Facebook is any measure. I suspect that it was engineered for a quick skimming over before being passed along on social media, where its eye-catching title ensures that many people will pick it up and in turn pass it along. Even without reading the article itself, every time someone glances over the title it does just a little to foster distrust of the United States, even if subconsciously. In our world today where social media is used by state-sponsored news agencies like Russia Today to spread half-truths and influence foreign opinion, by terrorists to drive recruitment and demoralize military targets, and by revolutionaries in the Middle East and Eastern Europe to overthrow governments, is it really any surprise that the United States military is researching it? For more about the future of social media and how it is being used by governments, companies, terrorist groups, and organized criminals subscribe now. I like such things to read. Good job.